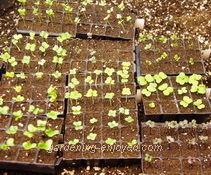 Dallying In The Dirt, Issue #161 --- The Broccoli and all the other cruciferae seedlings are up. Canada Blooms is well and truly under way and it looks like a great show. Our Garden Writer’s meeting was a great success and I finished the weekend just slightly exhausted. There is still no sign of any Snowdrops in my garden mostly because there is no bare dirt showing for them to emerge from. The Witch Hazel has very tightly closed buds. In previous years it has been in full bloom by the 12th of March and never later than the 21st. I did manage to find a few moments last week to prune the Hibiscus. It loses at least half of its size and almost all of last year’s new growth at this time every year. Each time I do this I’m certain that I have killed it but each year new buds magically appear from that old wood in about two weeks. 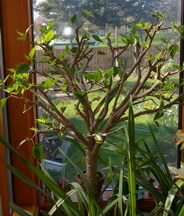 It was fertilized just before it was pruned to encourage that new growth. We have municipal composting here but the brown bag with the Hibiscus branches will have to wait several weeks before that program starts in the spring. All of those woody twigs would take too long to break down in my own compost. Down under the lights there is a great greening going on. All of the Cruciferae Broccoli, pak Choi, Cabbage, Cauliflower etc. have germinated and are rapidly growing. They moved out from under the plastic, humidity retaining covers, as soon as they germinated so that they would receive the maximum amount of light. We want to keep these seedlings as short and sturdy as possible and the intensity of the light is the controlling factor there. All of the Onion trays are filling up and growing up and looking quite good. I need to get the rebuild done on the cold frame to make room for all of these seedlings when they get transplanted in next weeks. As soon as the first pair of true leaves appear they will move from their seedling cells to the larger cell paks that will give them enough room to grow until they are ready for the garden. There are ten little trays of seedlings that all look the same. Nine of them have labels. I have no idea where the 10th label went but hopefully it will show up or I can do a process of elimination to determine just what it is. At our writer’s meeting we receive a significant pile of samples. Lots of interesting and new products whose suppliers hope we will try out and then write about. Over the course of this gardening season I will be evaluating many of these and reporting to you about any that I find to be particularly useful. There is always another new grass seed that will use less water and fertilizer and not need cutting; we’ll try that in a small corner of the yard and see what happens. I’m not a fan of grass at the best of times but I do have a few small patches. The folks at Contech regularly send us some of their fruit fly traps that really do work, there’s always one in my kitchen during the summer. Several new varieties of fertilizer, some chemical, some organic and all promising amazing results, we’ll see. A new product from Water Dots that is designed to act as a water reservoir when incorporated into soils or used as a mat, looks very promising. As usual, the fine folks at Fiskars show us their newest innovative quality tools, this year including a version of their easy to use pruners that are designed for people with smaller hands. Our job as garden writers is to wade through the claims on the press releases and let our readers know how these items actually work out in the garden. Stay tuned for updates. Marilyn Asks? Will the snow ever go away? When / if it does what problems can we expect underneath it? Ken Answers! I have no answer to the first query. Actually all of that annoying snow cover is very good for our gardens. It protects the perennials from the ravages of the extreme cold and it will regenerate the depleted water table when it finally melts.